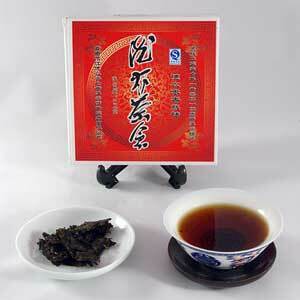 This tea, produced from small tea bushes, won the bronze medal at the Second China Yunnan Pu-erh Tea International Fair of 2007. The brew is rusty-red in color and exhibits a smooth earthy date flavor with a sweet aftertaste that is comforting and pleasing to the palate. It is best consumed after a meal. This is the best daily drinker I can imagine. Wonderful in gung-fu style, gaiwan or even thermos for at-the-desk and road trip events. Velvety, rich, deep dried fruits, layer after layer of goodness with each steep...and it steeps nearly forever through a series of constant changes. I highly recommend this tea. The 2006 Denong brick is really great Pu-erh.